The architects at WTL Design, with the help of BMW Building Design Senior Manager, Nicholas Ott, designed the BMW Brand Experience Center in Shanghai using a minimalistic approach. The project marks the first use of GKD’s Mediamesh technology in China. The stunning glass and white design evokes transparency, both in the building itself and the brand’s identity. The 21,500 square foot building utilizes interior Mediamesh screens that are visible from the outside, thanks again to the transparent glass façade. The building’s cubic form, with its reserved appearance, combines modern architectural design with the traditional form language of the adjoining Chinese pavilion, which houses the China Art Museum. Under the design motto “less is more,” the building is characterized by the idea and implementation of sustainability and transparency. This is further reflected in the use of energy efficient Mediamesh displays. Visually hidden in front of the glass parapet, between the first floor and the building ceiling, the panels, woven from stainless steel, transform the modern and aesthetic appearance. Four panels each measuring 9.8 × 11.8 feet and two additional 9.8 × 7.9-feet screens were utilized, providing the perfect setting for changing exhibitions or events in the Experience Center. The concept of the sustainability strategy underlying the building design supports the transparent media facade with further material-friendly advantages. The installation of the transparent media façade in front of the parapet serves as an internal sun protector, utilizing natural daylight for internal lighting needs. The fabric is almost completely recyclable at the end of its lifetime. Until then, the low maintenance effort and the energy efficiency of the SMD contribute to the sustainable facility management of the first BMW Experience Center in Shanghai for decades. The screens are attached above the suspended ceiling and tension-locked at the bottom edge of the fabric, which gave the desired integrated look. The six panels of GKD’s Mediamesh system attract passersby to visit the center through the use of graphics and video sequences. 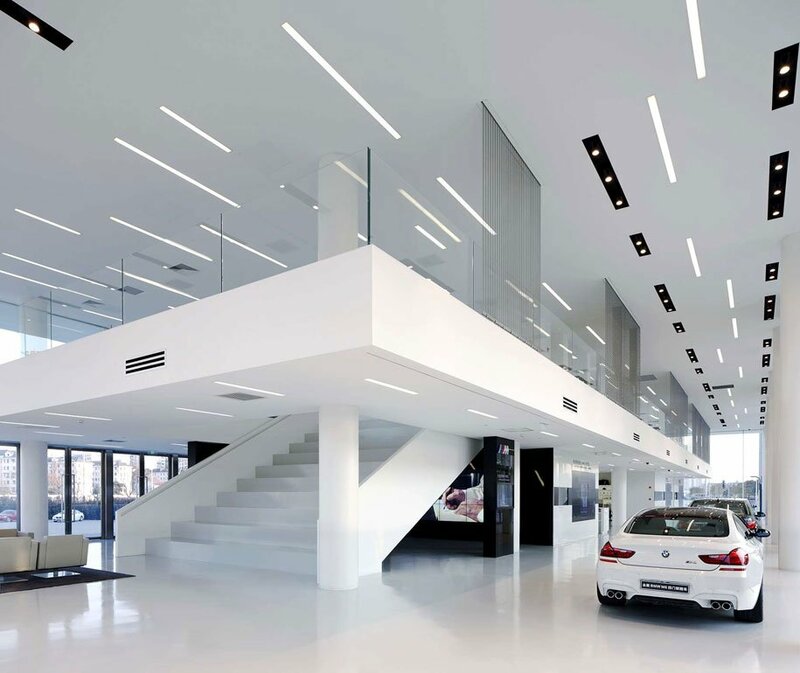 Additionally, they prove the showroom’s individual character and stand out from the otherwise optically cool, unified white interior. The Mediamesh technology enables the highest color quality and readability.